What influenced your decision to write for Teenagers? I’ve always loved children’s literature and YA. 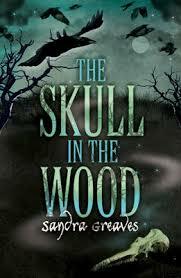 I didn’t make a conscious decision to try and write for teenagers, but when I started plotting ‘The Skull in the Wood’, my characters Matt and Tilda just emerged as aged 12 and 13. I feel very happy writing that for age group, and I’m interested in writing for an older YA readership too. How do you get into the heads of your characters? It’s a cliché that your characters take over, but they genuinely do. I try and imagine how they behave in all sorts of situations, not just the ones on the pages of the book. I even wrote a few scenes that I never intended to appear in the book, just so that I knew how Matt and Tilda had reacted at crucial times in their lives. Do you know instinctively what will appeal to Teens or is it more a hit or miss process? Mostly I write about what appeals to me – I don’t consciously gear it to a particular age group. If I get excited about it, I hope that teens will too. What is the most satisfying part of the writing process for you? Writing the early drafts is amazing – a story just seems to take shape out of nothing and the process is utterly magical. But I like the detailed editing too – I think you have enjoy that if you’re ever going to finish a novel, because if you get bored at any stage, your readers will too. Do you ever read the works of other Teen/YA authors? If yes what can you recommend? At the moment I’m reading Patrick Ness’s ‘Chaos Walking’ trilogy and really enjoing it. Meg Rosoff’s ‘How I Live Now’ blew me away, as did Sally Gardner’s ‘Maggot Moon’. And I loved Louis Sachar’s ‘The Cardturner’ – it just amazed me that you can construct a whole novel around playing bridge! Are any of your novels based on personal experiences? Not really – I like to make things up, and none of my characters are based on real people. But of course, things that have happened to me do have a knack of edging in where I least expect them. Are you working on anything new at the moment or do you have anything planned? I’m in the early stages of a new novel – but it’s way too soon to talk about it! Do you ever do Library visits to Teen Reading Groups? If yes, what is the best way to get into contact with you or your agent about it? I’m going to do some library and reading group visits in the autumn, and I’m always happy to do more – it’s great to meet committed readers! At the moment it’s best to email on tina(at)doublecluck.com at my publishers and requests will be passed on to me. And I’ll have a website up and running soon.